One of the joys of live theater is that there is always the possibility that something might go catastrophically wrong. I costumed Dirty Rotten Scoundrels a few months ago. Monday of tech week, the day after the production photos were taken, one of the two leading ladies went into the hospital. She was, obviously, replaced. Her replacement could not fit the same costume – the size was off, and she played the character differently. 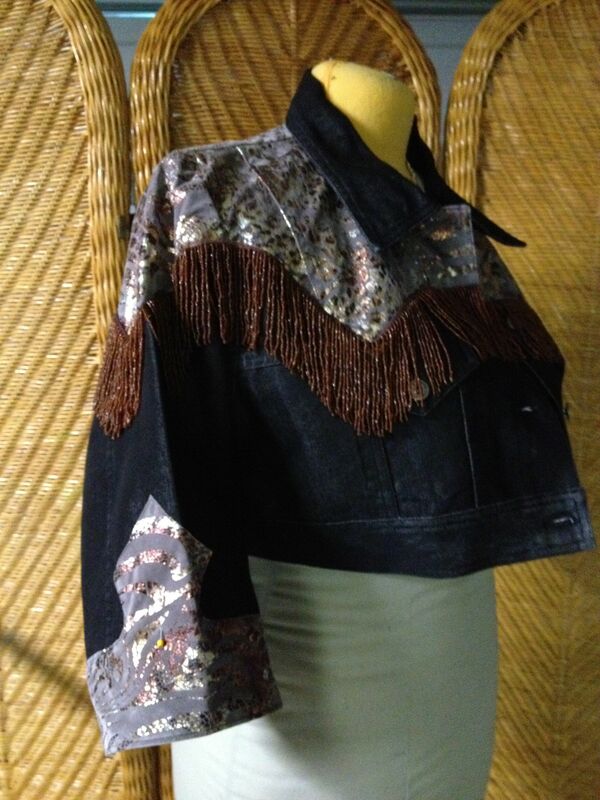 That sort of left me scrambling for a new concept (I settled on something around early Loretta Lynn meets GCB) and a some western wear that didn’t fall into my budget. Bring on the franken-jacket! The Thrift Gods smiled down on me when I was running around the Savers in a dead panic between work and call. I ended up with two jackets the same with similar shoulder cuts. That’s all you need for this trick. Well, you know, that, some fringe, a little time, and a little glue. Find a decent jeans jacket. I marked mid-upper arm on the actress as a reference point. 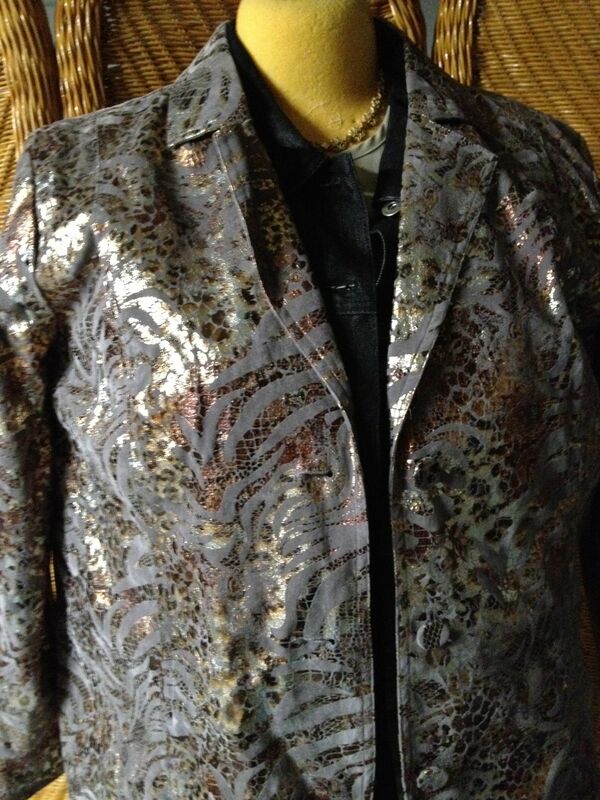 I mean, seriously, who doesn’t need a metallic faux-snakeskin print on some sort of completely synthetic knit moleskin? 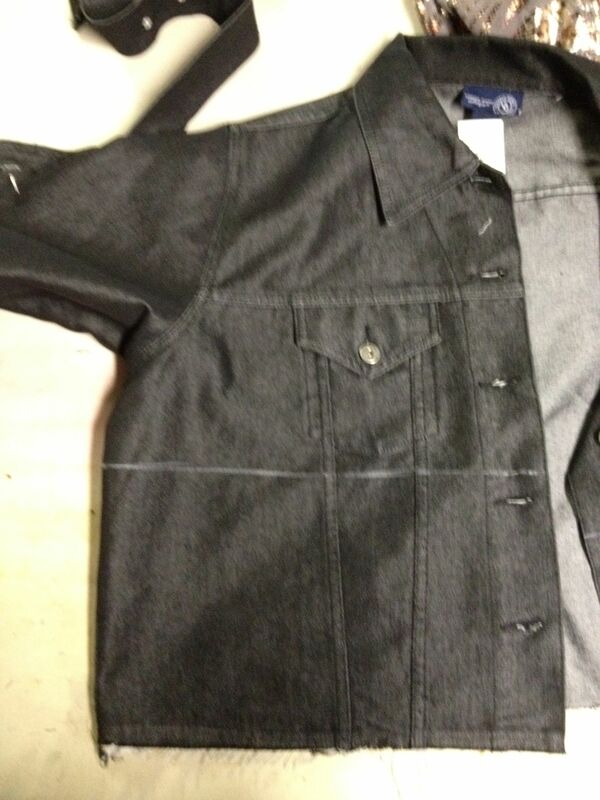 Now, the jeans jacket has a jeans-jacket style collar, and this fellow has a lapel. That’s ok. 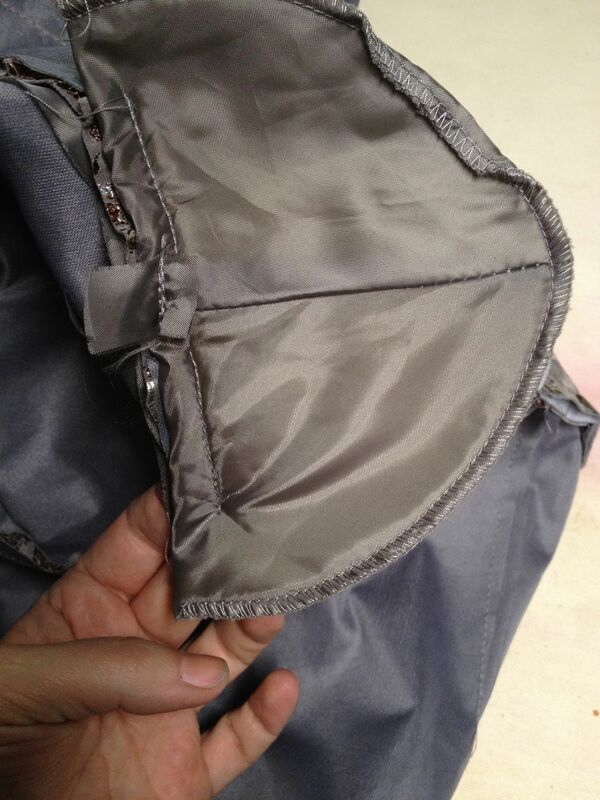 The lapel makes a straight line up from the front edge of the jacket when unfolded. 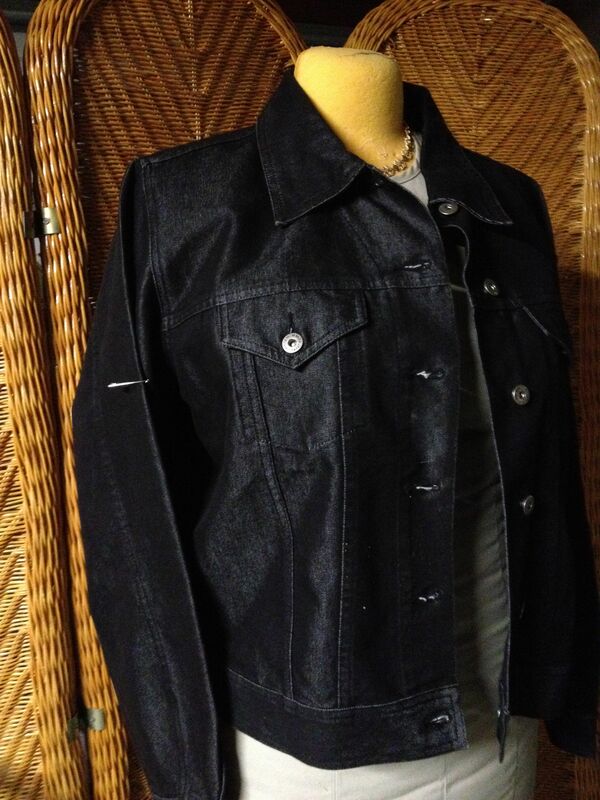 Remove the bottom band from the jeans jacket and set it aside. Figure out where you want to crop the jacket to, and mark 1/2" below that. Cut on the line. Generally speaking, a waist length or slightly shorter jacket will show off the figure on most women. A boyfriend jacket will hide it and emphasize the legs. Your standard issue, hip length jeans jacket will do absolutely no good for most bodies. 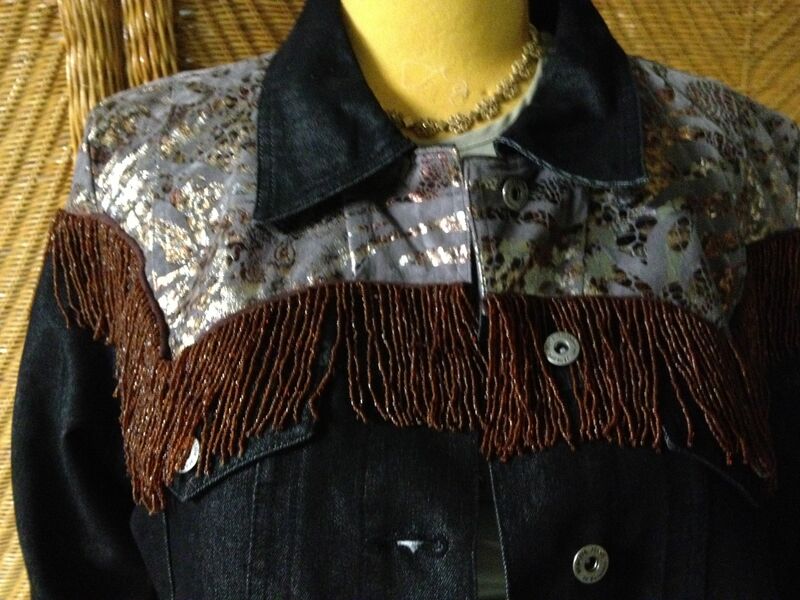 Pop that bottom band back onto the jacket. I'm going to shorten the sleeves as well, to about where the right one is rolled up to. Gut the contrast jacket. 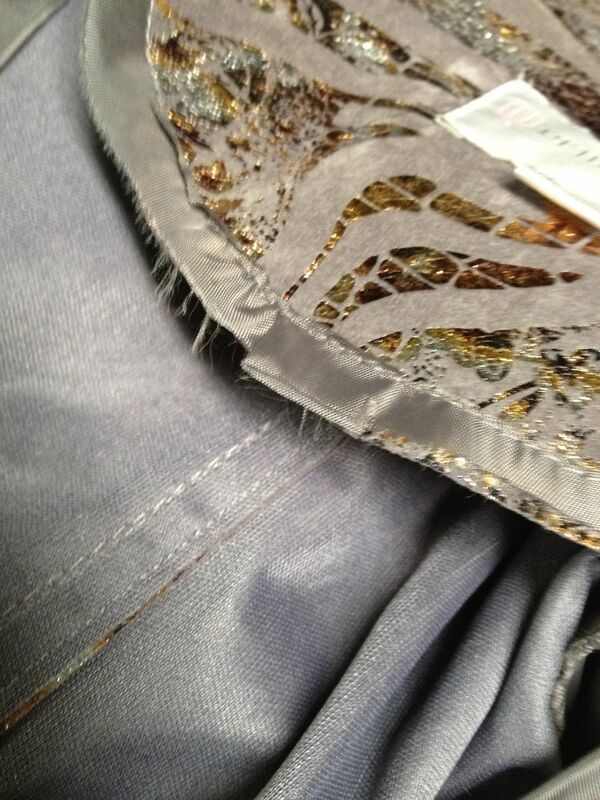 You can do this neatly with a seam ripper, or you can just jut it close to the seams. No one will ever see this part. 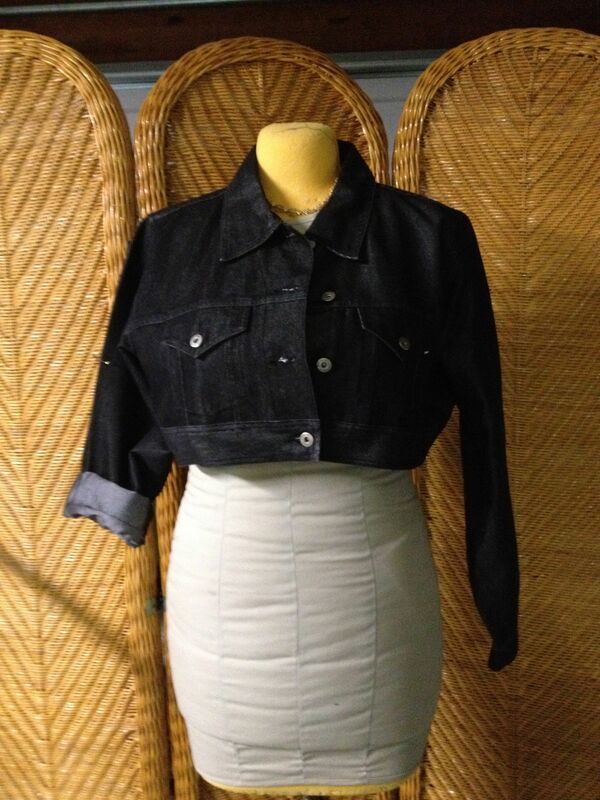 Put the contrast jacket on the jeans jacket - sleeves through sleeves and all. Smooth the shoulders together as much as possible, and pin. The contrast jacket is basically becoming one large shoulder appliqué. I am really, truly, phenomenally, remarkably lazy. 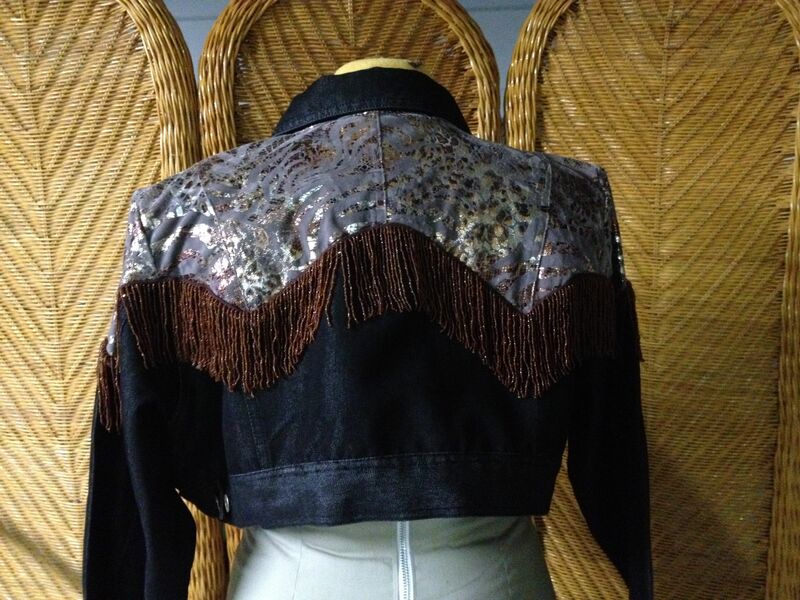 If I can sew the two jackets together and nail the fringe down in one go, I am going to do exactly that. Because then I don’t have to sew around the same line of the jacket twice. That one time will be more annoying than it needs to be, but I still won’t have to do it twice. Also, there won’t be a lot of random stitch lines inside the jacket, and really, what are the odds that I’m going to throw a lining into this puppy to hide all the ugly? Sew all around the contrast piece (including the front edges and around the base of the collar) then cut away the excess contrast jacket. The arcy-fringey business seems pretty C&W to me, so I embraced it in back too. I cropped the sleeves and used the sleeves of the contrast jacket to make a decorative little cuff appliqué. The cuff business is actually half hem and half appliqué – it’s hiding the seam allowance, like a fancy-dancy version of the ribbon hem. And we have the incomparable Harmony Barry, in her full costume, rocking the tackiest thing I have ever made. I love that she can do that! ps – The original actress is just fine now! :) All’s well that ends well. Missa, you are one amazing costumer! 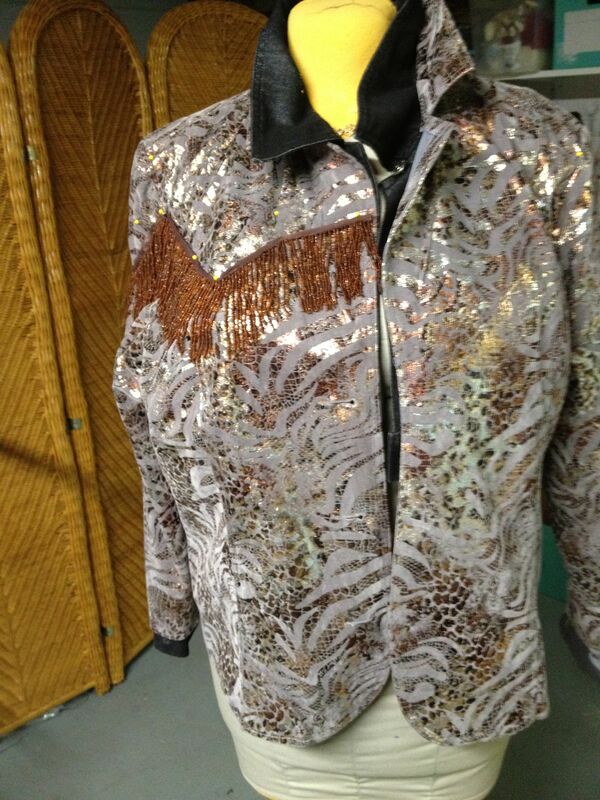 The tacky jacket rocks! What does it say about me, as a person, that I kind of want to do this even though I would never, ever wear the finished result? Anyway, great ingenuity, the finished result is so much fun, and the actress looks great in it! Some things are just too much fun… Tee!